They didn’t really stand a chance. They were sons, husbands, fathers, friends and boys – some as young as 18 – ordered over the top into the direct line of enemy fire. Bullets and bombs above you; the squelch and slap of mud and sludge beneath you. At least when you fell you had an instant grave. The Thiepval Memorial to the Missing of the Somme commemorates the 72,246 who rotted without a headstone; those “to whom the fortune of war denied the known and honoured burial given to their comrades in death”, says the preeminent inscription. The fortune of war? What a noble, heroic romance. The whole world was at it – from the Western Front to the Russian East; from Africa and the South Seas to Gallipoli and Mesopotamia: the scale was unprecedented. Some 30 million men were at arms, and munitions were expended to an extent hitherto regarded as impossible. Each year of agony brought its own devastating features: invasion and advancement were followed by interminable trench warfare and impasse. The Battle of the Somme was the bloodiest. A million or so men were either wounded or killed. It was a bloodiest hell in the history of human hostility. Imagine being 18, writing what you know will probably be your last letter home, thanking mum for being so good, kind and caring; knowing you’ll never see her again; you’ll never kiss a girl, feel the butterflies of first love, or hold your own son in your arms. This pit is where you will die for King and country. It is your duty, and you will perform it because, deep down, you know it’s right. This centenary falls in a week where we hear over and over again that the elderly “robbed” our young people of their future. By voting to leave the European Union, old people, we are told, have deprived the nation’s youth of their rightful future in Europe. No, it is yesterday’s young people who died in Europe so that today’s young people might have any kind of future at all. Old people haven’t robbed young people of their freedom or future in Europe: they gave it to them. The world is fallen, and our moral reason is as flawed as our political judgment. The law within us is torn from the law of God, and we generate conceptions of freedom as autonomy independent of reality. For some, the commandment ‘Thou shalt not kill‘ is absolute: life is the loan and blessing of God, and man is not free to end it. For others, human life has no supreme value: God commands killing for the just cause, and that requires surrender and sacrifice. Hindsight is a wonderful thing. As world leaders and royalty attend services of centennial commemoration, and priests and bishops preach of the futility of war and intone their laments for the fallen (while siding with the youth that they’ve been “robbed” of their future), the media is full of discussions and debates about tragedy, devastation, loss and colossal waste, and some will talk of casuistry, victory and justification. Christians pluck scriptures out of the air and conflate notions of holy war with Peter’s slaying of Ananias and Sapphira by his word. The Old Testament commands and justifies killing. The New Testament also countenances killing. But amidst a sea of texts that forbid it, there are anomalies and exceptions which establish the need for expository vigilance. What we now call World War I was a war of national self-defence. 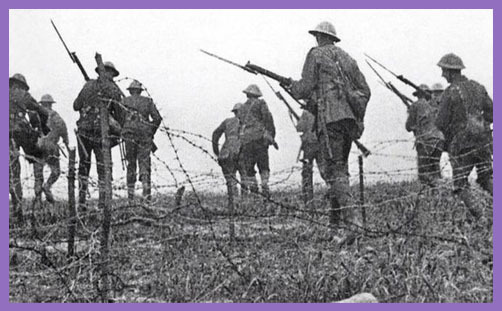 The Battle of the Somme was a bloody disaster, an unimaginable horror, but it was necessary. You may demur, but you may not do so with appeal to the commands of God or heaven-storming idealism. If you believe that war is fundamentally contrary to the will of God, and so unnecessary in the defence of honour, justice and freedom, then you must justify our national subjugation to tyranny and oppression. The deadly reality of modern warfare, with its capacity to obliterate whole continents and annihilate whole populations, may have disclosed the evil of war more vividly than the weaponry of the Great War. But the scale of human sacrifice 100 years ago is a constant reminder that there are no optimistic illusions: war is dark and ugly; its consequences horrific. Millions of our youngest and brightest freely enlisted in the service of God and King. Some signed up even before they were legally old enough to do so. Their country needed them, and they went. Most fought because they believed that the freedom and democracy of the British nation state is a value that Christians ought to defend, for it was the source of their whole physical, intellectual and spiritual life, and so crucial to their relationship with God. That was and remains the theological view of the Church of England, whose chaplains prayed, wept and bled alongside those who fell, and whose successors commemorate today their noble sacrifice.